Due to irregular surface in connections a gasket is required to prevent the leaking of gasses or fluids at the joint. As a gasket is made from a deformable material it will fill the joint and prevent leaking under compression.We will manufacture the gasket to meet you requirements for eg. Temperature and pressure.Our CNC machine can cut gaskets from customer supplied CAD drawings.We have a wide range of Blade dies to punch out gaskets to our customers requirements. 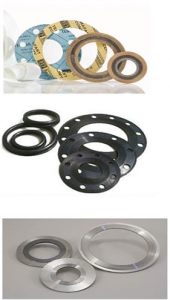 Metal gaskets are used in a condition which requires a gasket to withstand high pressure or temperature. Copyright © 2017 Belting Supply Services. All Rights Reserved. Copyright © 2016 Belting Supply Services. All Rights Reserved.